SCORE is dedicated to helping entrepreneurs succeed. As part of that goal, we offer these educational resources to help you plan for that success. These workbooks offer practical information and exercises that will help improve your chances for success in starting or growing your small business. You don’t have to go it alone. In addition to these workbooks, SCORE provides other great resources like mentoring and workshops. Attending the Simple Steps workshops, which include one-on-one mentoring with a SCORE expert, will provide you with the knowledge you need to develop sound business strategies. It’s all about helping you live your dream. Check to see if the Simple Steps for Starting Your Business or Simple Steps for Growing Your Business programs are offered in your area by visiting our local workshops page or by contacting your local chapter. 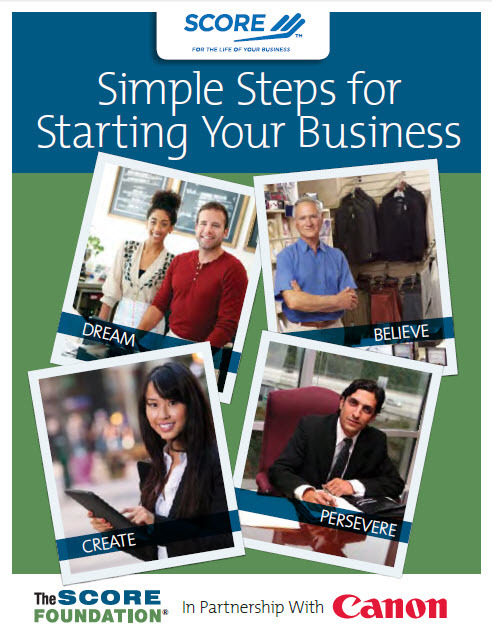 Or take the Simple Steps for Starting Your Business online course. Learn how to start your business with practical information and helpful exercises. Download this free guide by SCORE mentors, sponsored by Canon, U.S.A.
Get marketing, human resources, operations, management, and finance strategies to grow your small business. Download this free guide by SCORE.